Planning a vacation to Europe can feel like a roller coaster - one minute you're living the dream, in your mind you're strolling down Parisian sidewalks in your perfect pedal pushers and ballet flats, baguette tucked under your arm and that cute beret tilted just so over your shiny hair, and the next minute you're waking up in a cold sweat at 2 a.m. because what-if-the-hotel-you-booked-is-in-a-terrible-neighborhood-or-there-is-mold-in-the-shower!?! If you're crossing the pond or another continent to get here, prepare yourself in advance. Drink lots of water before and during the flight. I swear this is the biggest help in the fight against jet lag. Since you've been drinking so much water, you'll have lots of reminders to get up and walk around (i.e., to the toilet) frequently during your flight. No one wants blood clots in their legs or painfully swollen feet when they land. Walking will help. If you have clotting issues or are greatly concerned, talk to your doctor about compression socks; he or she should be able to help you decide if they could be beneficial for you. Orbitz, Priceline, and Expedia are also great ways to find flights and it's nice to work with a website you know and trust. Oh, how I love trains! I'm from the South and we just don't do public transportation much so this one was a bit intimidating for me at first - but I absolutely adore it now! I know, it's weird and people smell but it is usually super convenient and it means I don't have to drive myself. Winning! ONE | The regional trains are mostly local. They go from town to town within a set area. If you're traveling outside of that area you'll have to connect (sometimes several times depending on how far you're going) to another train. These are usually the least expensive way to travel ... and also the least comfortable. The seats may be hard plastic (if there are any seats available), they probably don't have air conditioning, and they are slower moving with more stops. It's not bad if you're only going a few towns over for a festival but not your best choice if you're going very far, say from Paris to Barcelona. TWO | Long distance trains are much, much nicer than regional trains. They travel at high speeds with very comfortable seating, are air conditioned, and some even have wi-fi access (or so I've been told- I've never had any reason to use this amenity). Be prepared at some point on your journey to have your ticket and passport checked by a proper authority. When buying tickets at a kiosk, look for the language option and switch it to English (or your language of choice). It's on there somewhere, often marked with a British flag. Kiosks have an itinerary option, as well. Look up the times of the trains and print it out to keep with you. Go into the ticket or tourism office and ask for help. Someone there will be able to speak English and explain your options and will even help you buy the ticket and print an itinerary for you. This is a great place to find out if the rail line you're using has any sort of discount ticket - sometimes you can get an entire weekend pass for close to the same price as a day pass. Do a little research before you go and ask questions. Make sure you know which types of trains you can travel on with your ticket and ask how to identify them (they are usually marked on the side). Don't accept help from beggars on the street when purchasing tickets from a kiosk. They expect you to give them your change as a gratuity and are hoping you don't understand the exchange rate so they walk away with more. Also, beware if one adult is "helping" tourists buy tickets and has several small children with him or her... you might get pick pocketed. Watch your belongings. In this situation, Mike & I usually divide responsibilities. If he's buying the tickets, I'll take a step or two back with our bags and watch him and the people around him to make sure he isn't pick-pocketed. We do this at ATMs, too, and when I stop to take pictures he stands a few steps away and watches people around us, just to be safe. It's not terribly unsafe here and I don't want to give you that impression, but you do have to be smart and look out for yourself. Stand up straight, look people in the eye, and be assertive. You'll be fine. Watch your belongings on trains. Most Europeans are very honest and would never think to steal, but of course, there are a few bad apples - just like anywhere else. Be smart. Don't take a nap while your purse is on the seat across from you wide open. Don't open the little garbage container. People pee in those sometimes. It's not common but we learned the hard way traveling from Florence to Rome. Please just trust me that this is not an experience you need to have to feel your European vacation is complete. Save your trash for a big open container so there are no surprises. A few of my favorite links: SNCF (my absolute favorite site for buying tickets for France), Deutsch Bahn, and Interrail. Google will provide you with a lot of options (like the Rail Europe Blog, which is pretty fantastic) but those are just my favorites. With both planes and trains, look for the best deals 60-90 days out (yes, this requires some planning). Sometimes you can get some great last minute deals, but they are harder to find. One more tip, and this has to do with your mindset - As Americans, we are programmed to gogogo and sometimes it's hard to slow down and enjoy the journey. But please try to. Things may go wrong, you might miss a train or a connection, but it's ok. It's an adventure and having a good attitude will go a long way towards making your trip a happy memory rather than something you never want to do again. It's not terribly difficult to drive in Europe on the main highways. The signs take a little getting used to so I'd recommend studying those a little bit before your vacation. In small towns and villages, the roads do get very small at times so keep that in mind when choosing a vehicle. I don't recommend driving in large cities... or pretty much anywhere in Italy. Paris is a nightmare to navigate even when you've done it a few times and you've heard about the stereotypical "traffic-laws-are-for-others-Italians," right? Yeah, it's totally true. I would never attempt to drive in London, either - navigating around in crazy traffic while trying to drive on the other side of the road and not run over any pedestrians?! No, thanks. The good news is all of these places are very walkable and have great metro/tube access. Use that and thank me later. On the other hand, I do think Ireland is a great country to drive across, as is Poland. There are so many more beautiful places to see that just aren't as easy to reach by train. It's a perfect place to slow down and take your time and not feel rushed to get to the next stop. And if you ever get a little freaked out (it'll probably happen on Ireland's west coast near the cliffs), there are tons of gorgeous places to pull over and take a break. Keep some picnic foods and your camera handy, just in case. If you plan to drive to Eastern Europe, let your rental company know. It will limit the vehicles you can choose from as car theft is more common there so rental companies don't allow their premium vehicles to go there. We've driven around Poland, Czech Republic, and Croatia with no problems at all, though, so don't let the statistics scare you. Prague is amazing and absolutely worth the drive. When budgeting, keep in mind that parking is crazy expensive in Europe. A two hour shopping trip could cost 12 euros easily and I've seen 24 hour parking for 30 euros before. That adds up quickly. Your best bet for parking near a major city is usually a Park & Ride (a parking lot on the outskirts of the city near a metro station that will take you to the center). A quick internet search can help you find one near your destination or you can email or call your hotel and ask. Gas is crazy expensive, too. Diesel is much cheaper in the long run. It's worth it to get the extra insurance coverage (depending on your personal insurance policy, of course). No one thinks it's a big deal to bump a car so scratches and scrapes happen a lot. Cars also get broken into frequently, so don't leave valuables laying around. Speeding tickets happen by camera and they can be very expensive. They will catch up to you eventually. We recently received a ticket from the Netherlands from over 6 months ago. Speeding tickets in France are extremely expensive, too, so really watch your speed there. 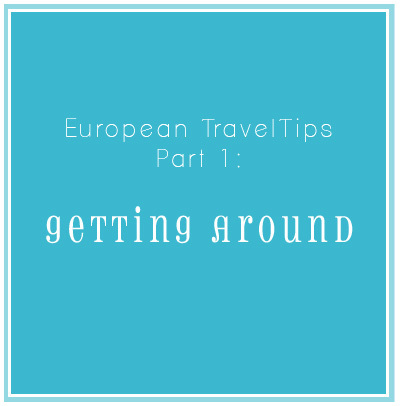 That's all I've got for the basics of getting around Europe. I didn't mention metros and trams, but my main tip would be - use them. They're awesome and easy and will save your feet a million times over. Look for discounts on multi-packs of metro tickets or a multi-day card. If you like to carry a metro map, check with tourist info - they will have them. Sometimes they are at the bigger metro stations and many hotels have them on hand, too. I'd love to hear your tips for traveling Europe (or anywhere else) if you have any. And if you have a question you think I can answer, please ask! I'll help if I can. Oh, and please don't wear a beret in Paris. It's a bit cliche. Maybe consider something like this cute fedora instead.